VCE’s work over the past quarter-century has led to the recognition of Bicknell’s Thrush as a globally rare and vulnerable species in need of serious conservation efforts. This enigmatic migratory songbird breeds only in high-elevation balsam fir-dominated forests of the northeastern U.S. and southeastern Canada, and is estimated to number fewer than 100,000 individuals. In addition to chronic threats to its summer breeding grounds, such as recreational development, telecommunication and wind turbine development, acidic precipitation, and the wide-ranging effects of climate change, the plight of this bird’s Caribbean wintering grounds is even more dire. An estimated 90% of the global population of Bicknell’s Thrush overwinters on Hispaniola, the shared island of Haiti and the Dominican Republic, where destruction of forested habitats has been severe and is ongoing. A new study led by VCE biologist Kent McFarland and published in The Condor: Ornithological Applications employed statistical modeling methods to identify remaining key habitat for females in fragmented, wet, montane forests of the Dominican Republic. Further, this study served as the driving force to conserve adjacent private land that have expanded the thrush’s wintering habitat. While all males and females migrate to a limited geographic area comprised of only four Greater Antillean islands, the habitats where they actually spend the winter differ by elevation. Females tend to inhabit mid-elevation forests that are more vulnerable to human disturbance than the higher-elevation, more remote, relatively pristine forests used by males. “With female survivorship thought to be a primary limiting factor for the species, we wanted to determine what areas might remain outside of the existing small reserves and see if we could begin to conserve these as well,” stated lead author McFarland. 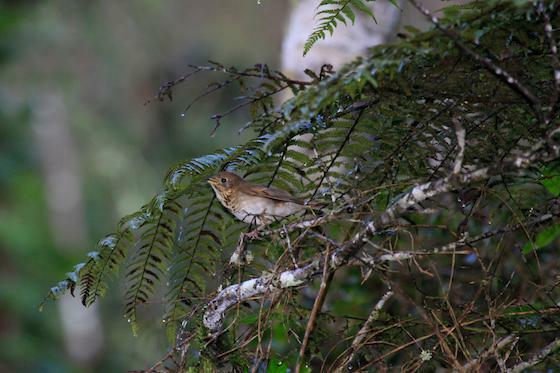 McFarland and his colleagues combined field surveys and occurrence data with environmental and elevation variables to create a model of thrush distribution and habitat selection in the Dominican Republic’s Cordillera Septentrional. Then, by applying criteria from their model to a region-wide assessment of available private properties, they identified a 400-hectare abandoned farm situated between existing protected areas that contained environmental conditions suitable for Bicknell’s Thrush.